In an address at this year's World Language Symposium in Dortmund, leading punctuation expert Professor Connie Brackets announced the worrying news that the world's supply of apostrophes would soon be entirely used up, unless serious efforts were made to conserve dwindling supplies. Like most punctuation, apostrophes are formed by intense geological pressures acting upon sedimentary layers laid down millions of years ago. Over 80% of the apostrophes in circulation today, along with half of the planet's ampersands, are supplied by deep pit mines in South Africa. Despite being confined to such a small geographical area, deposits are plentiful and a shortage has never been anticipated. Until now. Following a ten-year research programme, Professor Brackets and her team have discovered that apostrophes are being employed at a far greater rate than previously thought, partially because of the popular craze for unnecessarily inserting them into plural's. There is no shortage of enthusiastic proponents of this purely decorative approach to apostrophe use but, says the Professor, it means that stockpiles are dwindling. "The real problem," the Professor told us, "is that the general public don't really appreciate that punctuation supplies are finite. There's only so much to go round and once it's gone, it's gone. In the last hundred years we have already lost over sixty forms of punctuation. Once common marks such as the asterflange, the pockmark and the semi-trump are sadly now extinct and many more are in danger of going the same way." Some experts are putting their faith in recycling as a way of meeting the demand, but extracting text from waste books, pamphlets and magazines is a tricky business. Documents have to be boiled, reduced to a pulp and then spun in a centrifuge to remove excess vowels. The characters are then dried and sorted by hand, but punctuation is notoriously fragile and many of the apostrophes emerge from the process all bent and crooked, and are ultimately unusable. Another suggestion is extraction from seawater. This technique was successfully pioneered in the late eighties to liberate the @ symbol from solution, without which the internet revolution could not have happened. But the process is expensive and apostrophes manufactured by this method are notoriously unstable and smell of tapioca. A more palatable solution would be to split speech marks (" = ' + '). There is a practically limitless supply of double quote marks which, when bombarded with high-energy hyphens, will produce two stable and relatively odourless apostrophes. The problem at present is that hyphens are themselves quite rare and until scientists can figure out a way of making it work with semi-colons the process remains unviable, consuming more punctuation than it actually produces. In the meantime, Professor Brackets insists that we need to impose strict limits on apostrophe use. She has suggested a figure of ten apostrophes per five hundred words. Rationing punctuation might seem a little harsh, but the Professor insists that it is the only option - even if it does mean that an article like this wouldve used up its quota before reaching the final sentence. 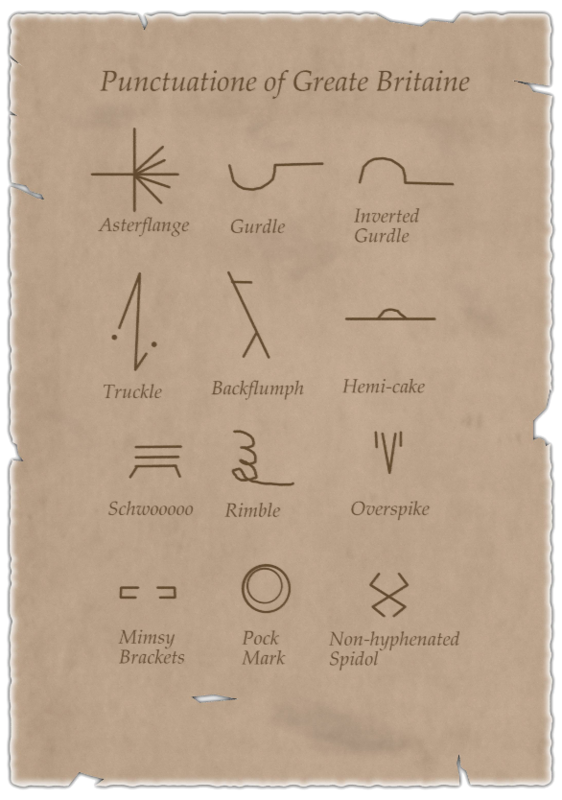 This recently discovered document, dating from the mid-seventeenth century*, shows some of the once common punctuation marks that have since disappeared from our language. Little is known about precisely how they may have been used. *You can tell it's old because it's brown.